Synopsis from Goodreads: No one gets in without being asked. And with her untamable hair, large forehead, and gawky body, Tookie De La Crème isn’t expecting an invitation. 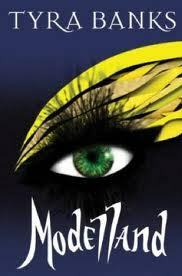 Modelland—the exclusive, mysterious place on top of the mountain—never dares to make an appearance in her dreams. But someone has plans for Tookie. Before she can blink her mismatched eyes, Tookie finds herself in the very place every girl in the world obsesses about. And three unlikely girls have joined her. Only seven extraordinary young women become Intoxibellas each year. Famous. Worshipped. Magical. What happens to those who don’t make it? Well, no one really speaks of that. Some things are better left unsaid. Thrown into a world where she doesn’t seem to belong, Tookie glimpses a future that could be hers—if she survives the beastly Catwalk Corridor and terrifying Thigh-High Boot Camp. Or could it? Dark rumors like silken threads swirl around the question of why Tookie and her new friends were selected . . . and the shadows around Modelland hide sinister secrets. Are you ready? Modelland is waiting for you. . . .
My review: Wow. What the hell did I just read. I’m serious. I did not understand half the words because there was too many that were garbled and just funky. I guess that’s kinda how Tyra Banks herself is though. Anyways, most of the time when I was reading this (and you can see this on my Goodreads updates too) was it just kept reminding me of a modern day Brave New World. Brain washed people, a society that craves one thing only; fashion, and it was just dark. Like underneath all the fluffy “haha yay fashion!” it was depressing. Enter into a world with a plethora of self-harm, depression, self-loathing, and a crap ton of girls being mean to each other and constantly putting each other down. Side note: what the hell kind of name is “Tookie”!? But I digress. I can’t even really explain this book. It seemed like a bunch of word vomit, like Tyra couldn’t get out enough details. And it was sooooo long! It did not need to be 575+ pages! There were just so many scenes where I was like I just don’t care about either the characters or what was happening to them. I thought the main premise of the story would just be a sort of coming of age novel where a girl accepts herself for who she is and not want to conform to societies standards. Instead I got a novel full of self-mutilation, babies being birthed into toilets (I’m not even kidding) and crazy words and phrases in this crazy self-obsessed world. Makes you wonder what else Tyra day dreams about.